Google Analytics remains to be one of the most underused digital marketing tools by the businesses. It provides you with the means to measure all the results of individual campaigns running in real-time along with comparing the data to previous records and much more. There are numerous reasons for using Google Analytics to measure your website’s success. It allows you to monitor all the platforms which in turn helps you to review what is actually working well for you when it comes to advertising and what is not delivering results. Having entire data at one particular place makes it quite easy to compare the different channels. Google Analytics also allows you to track a lot of important metrics and hence covers all aspects. You can essentially monitor the effectiveness of online marketing campaigns and strategies along with onsite content, device functionality as well as user experience. All these essential statistics show you what is performing well and most importantly tells you about what you should discard. Once you have identified the issues that your website may have, you can create a solution, subsequently. It allows you to get the information required to improve your website and in turns helps you in making it best. So, when it comes to analysing Google Analytics data, you require a robust tool to get worthy suggestions. KOBIT is one of such extremely good software. It allows you to analyse your Google Analytics data and then break it down into much more easy and comprehensible language with the use of graphs. Using plain English and graphs, it provides you with the capability to intuitively understand what exactly is driving the performance of your website. It provides in-depth analysis of referral traffic along with goals conversions as well as all the associated complicated matter which are translated easily. Hence, it allows you to prove your ROI to anyone without any hassle. The procedure followed by KOBIT is quite straightforward and easy to understand. Once you have registered, all you require is click and get the results. This software provides professional web analysts who offer you comprehensive reports. Hence, you receive a well-documented report. It includes entire analysis along with rigid structure as well as understandable graphs. All of this is included in the generated report. As mentioned earlier, it is quite a straightforward tool. Unlike other reporting tools, you don’t require any knowledge of Google Analytics before its use. Despite the reports are simple and easy to understand, their target are Digital Marketing professionals that understand what they must to do next after reading the KOBIT guidelines appeared in the report. Anyone can easily use this service in order to learn basic knowledge of how the data present on Google Analytics can be used. This software certainly saves a lot of time by creating reports in minutes. In case you are outsourcing your online marketing, it saves you a lot of time and money. It offers you the ability to customize all of your reports with your company, client or agency’s branding. It supports your work process and reporting structure. The report is essentially extracted as a PowerPoint which means that you can change it any way you like. The report is completely yours, and KOBIT’s name doesn’t appear anywhere on the report that is generated. Another salient feature of this software is that it helps you in building a better relationship with your clients. It is often seen that it is quite difficult to get a completely analysed report for all clients. It can become quite uncomfortable during the meeting with your client and explain everything from the start. Using this software, you are provided with the report which can be understood by your clients easily and comprehensively. This software also allows you to enhance your sales by means of showing you what you can actually achieve using the data-driven report. KOBIT provides reports for both SEO Keyword Analysis (Search Console) Reports as well as KOBIT Analytics (Google Analytics) Report. KOBIT is a trusted name in the market which is making conscious efforts in increasing the security with standards stricter than the Privacy Protection Law. Another salient feature is that it uses API to communicate as well as obtain information from Google Analytics which ensures that none of the client’s information is stored in its database. From Funnel Analysis to User Attribute Analysis, it provides a complete analysis of your site and then creates a 11-page PowerPoint report. In case clients who want to have only data rather than PowerPoint slides, it exports an Excel file which contains all the analysis data that is used in the report. 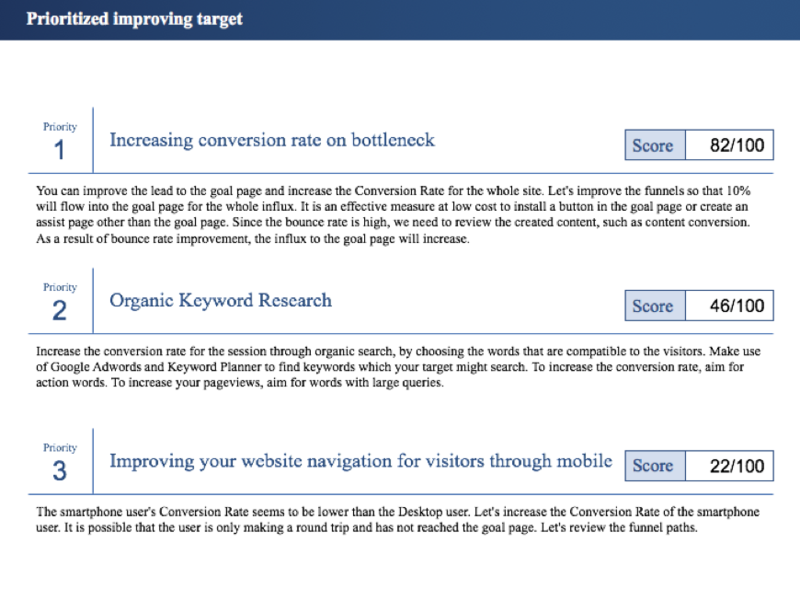 Here’s the sample report below that shows the intuitiveness of the platform, it provides users proper guidelines that you should apply to increase your website revenue. This is by far one of the most unique and brilliant feature KOBIT has in my opinion. It is a straightforward software with intuitive interface. It is quite easy to use and doesn’t require any previous knowledge of Google Analytics. It provides comprehensive generated reports which contain all the essential data along with graphs to clearly depict the meaningful metrics. It saves both time and money as it generates reports within few minutes. It streamlines online marketing efforts by assisting you in measuring the ROI of your campaigns. It doesn’t include any social media analysis, which can surely add it value if it can do it in future. The reports are generated in PowerPoint and Excel format only. For the first time, you can easily access to its Free Trial Campaign in order to generate Google Analytics Report. You can start using this software at mere $50 per month and generate automated Google Analytics report without any hassle. Google Analytics is a great tool to assess the performance of your website. It provides you details information about your website metrics, ROI of online campaigns and other aspects. But, for some users, Google Analytics can be a bit overwhelming. It can be quite complicated to navigate through and understand the data that it shows. 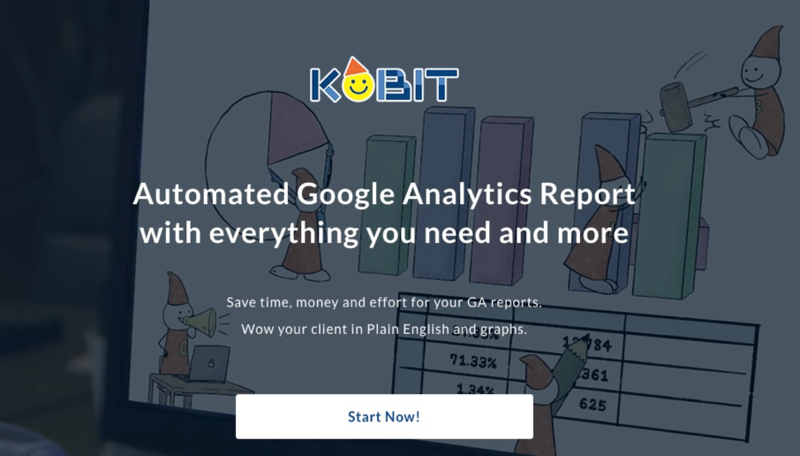 In such cases, KOBIT is a great tool which helps you understand Google Analytics data with ease through its comprehensible generated reports. It is easy to use software, and even users with no knowledge of Google Analytics can use it too. It provides an in-depth report of Google Analytics of your website, and you can get the report in PowerPoint slides or data in Excel file as per your convenience. It is a great tool which certainly saves time and money of the users and helps them in maximizing their ROI of their online campaigns and getting a deeper knowledge of website performance. We suggest this software to everyone who wants a comprehensive report generating tool of Google Analytics to improve the performance of their website. How an Alarm System Protects your home in case of an Intrusion?